"Ma'am, are you feeding the rats?" I asked. She ignored me, continuing to shower the ground with white bread. When I repeated myself, she turned away without acknowledging me and retreated across the street. At the end of the mild winter, there wasn't a single night that I didn't spot Rattus norvegicus darting across my headlights or see its tracks in the snow or find its holes tunneled through the dirt of my garden beds. Here was an advocate for the species, an abettor of the plague, a domestic acolyte of the Karni Mata Temple in Rajasthan, where some 20,000 rats are pampered and worshipped as the reincarnations of the children of a Hindu sage. The rodents aren't received so well in Chicago, where rat complaints to the city are up nearly 70 percent over last year. In response, homeowners are employing colonies of feral cats to try to diminish the onslaught. At least one alderman has floated a proposal to protect coyotes that would allow the pests' natural predator to feast without fear of Animal Care and Control. And the city has reinforced its rat abatement teams and stiffened fines on residents who neglect to clean up their pets' feces, said to be like bonbons for rodents. I can't imagine the old woman's motivations, but I was certainly curious. Is it possible that this universally reviled pest has fans? Is there a reason to love rats. Or at least show them a little respect? 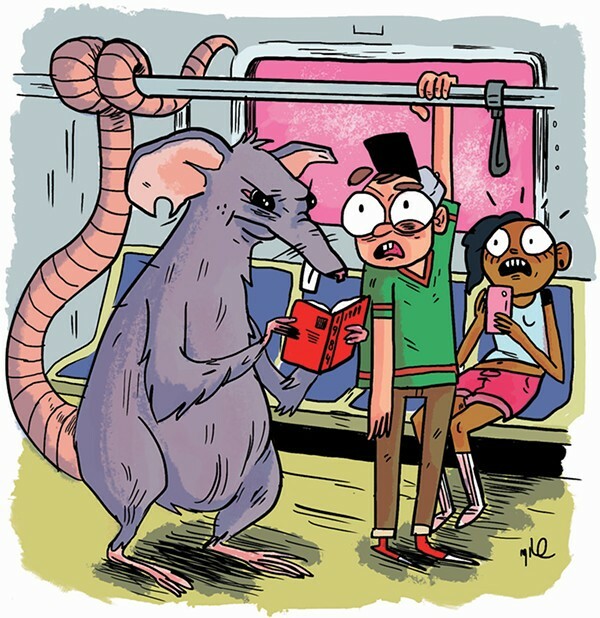 "Rats are a reflection of us," says Steve Sullivan, former senior curator of urban ecology at the Notebaert Nature Museum, currently director of the Hefner Museum of Natural History at Miami University in Ohio and my go-to expert for advice on urban wildlife. Rats, Sullivan points out, are remarkably intelligent. They can figure out when we've poisoned their food and when we've set traps. They can adjust their schedules so they don't conflict with ours. They stay pretty clean in their nests. And while they enjoy the same food we do, they turn their noses up at it if it's unfamiliar. Sullivan even questions the notion that rats actually eat dog poop, though he admits his assessment is based on anecdotal observation. "I have never seen dog feces with signs of rodent foraging—and I'm looking for this kind of thing all the time." Rats can also help domestic animals get in touch with their animal instincts. This spring my pit bull puppy darted to the backyard fence in broad daylight and seized a squeaking rat in her jaws before prancing around the yard tossing it into the air like an orca with a baby seal. Furthermore, you rarely find rats in places where there aren't any humans. If we weren't such slobs, there wouldn't be so many of them. By multiplying with a boost from our casually discarded waste, rats are just being the best rats they can be. Did the polar vortex make a dent in the city’s rodent population? The short answer: you wish. Also, Harvey Weinstein's unlikely 1985 Bears connection. This isn't pest control. This is war.